Note that its health is still displayed in the bottom-right. A unit can only be clicked once per turn. On the battlefield, units that have already been clicked are indicated by dashed lines placed over them. A clicked unit cannot block (if it was originally blocking) until the start of your next turn. Note that the background has changed from blue to black, to indicate that Drone could no longer block. The shield is replaced by a hollow shield to indicate that the unit was originally blocking. An Engineer cannot be clicked (because it has no click ability), and is always blocking. A Drone is blocking by default at the start of your turn, but cannot block for a turn if you want to click it to produce gold. Now that we’ve seen all these units that harvest resources, let’s learn how to spend these resources. On the left side of the screen you will see the buy box, which contains the list of units available for purchase in the present game. Some games have a second tab of purchasable units; click the second tab to see them. If you have sufficient resources to buy a unit, click it, and those resources will get subtracted. There is a limit to how many of each unit you can buy. The pellets at the bottom indicate the supply of each unit you have remaining. Each unit has a different starting supply (either 1, 4, 10, or 20). The clock in the top-left with a “1” on it indicates that the Drone requires 1 turn to finish construction. 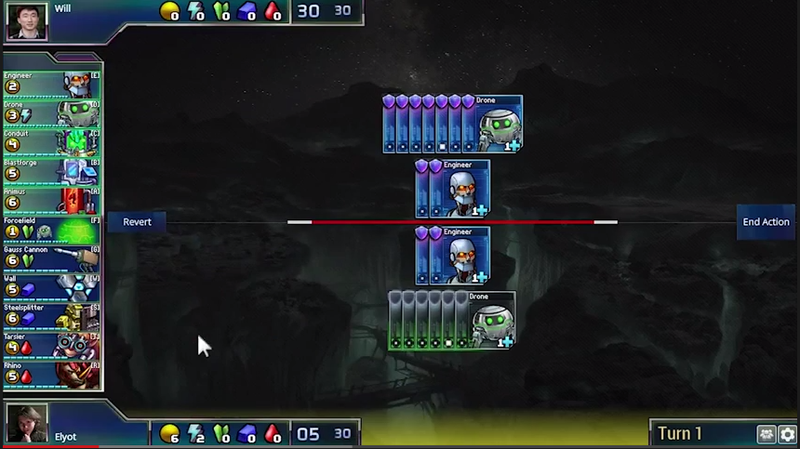 Units get constructed at the start of your turn, after which they immediately do something (if they do something at the start of your turn), can block, and can be clicked. Some units produce attack power when you click them. Others automatically do so at the start of your turn. In general, units need to be clicked when there is an alternative benefit to not clicking it (such as being able to block). The Steelsplitter must be clicked to obtain its attack potential. Shadowfang automatically generates attack at the start of your turn. Once you have collected resources, bought new units, and collected attack power, you are ready to end your turn. At this time, damage equal to your attack power (if greater than 0) gets distributed among your opponent’s units. Add up the health of your opponent’s blocking units. We call this number your opponent’s total defense. If your attack power is less than this number, then your opponent gets to defend, ie. they get to choose how to distribute damage to their units. Defending with a unit means assigning damage to it equal to its health. Such units are said to receive lethal damage, and die. Your opponent clicks blocking units to defend with until all damage has been assigned. The final unit they defend with may not receive lethal damage, if the damage remaining at that time was less than its health. In this case, that unit lives on, absorbing its damage with no permanent change to its health. Their total health is 1 (Engineer) + 3 (Steelsplitter) = 4, which is greater than your attack power, so they get to defend. Their choice of defense depends on whether they’d rather keep the Engineer alive or the Steelsplitter alive. If your attack power is at least your opponent’s total defense, then you get to breach, ie. you get to choose how to distribute damage to their units! The “End Turn” button will be replaced by a “Start Breach!” button. When you click it, all of your opponent’s blocking units (if any) will automatically be assigned lethal damage, and die. If you have damage remaining at this point, you can assign it to your opponent’s non-blocking units by clicking them. Note that you must have lethal damage to kill a unit. If you have 2 damage remaining and all they have are Blastforges (which have 3 health), then that 2 damage expires at the end of your turn without doing anything. While breaching, you are not allowed to assign damage to units under construction unless you have already killed all units not under construction. When you start breach, they will both die, and you will have 2 damage remaining. Let’s say their non-blocking units include a pile of Drones (1 health each), a pile of Shadowfangs (1 health each), an Animus (2 health), and a Blastforge (3 health). You could kill any combination of Drones and Shadowfangs, or kill the Animus, whichever you prefer. You couldn’t damage the Blastforge. This means that you can damage a Gauss Cannon while breaching, even if you have less than 5 attack. It simply won’t kill the Gauss Cannon; it will merely reduce the health of the Gauss Cannon, making it easier to kill on a later turn. Note that fragile units have a instead of to indicate their health. In defense, a unit with fragile behaves the same as a normal unit, except if it absorbs damage as the last defender, its health is permanently reduced. On top of being a normal blocker, Wall is prompt, which means it is blocking as soon as you buy it. So unlike Engineer (which cannot block the turn you buy it), Wall does not require a turn to finish construction. 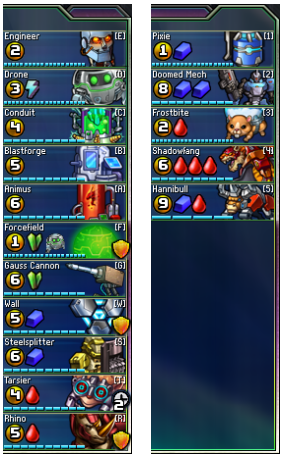 This concludes our exposition of the fundamental rules and abilities in Prismata. There are some additional abilities, but they are simple enough to be explained in the unit descriptions. Overall, there are very few rules. But of course, the real challenge is to develop through experience an understanding of how the game elements interact, and how different situations play out. Prismata presents endless strategic decisions to the players, as every game is different.